I bet Sarah is tired of the stupid repetitive questions. Acosta keeps asking over and over again and she’s tired of giving the same answer over and over! However, she decided to give him an eloquent, accurate response that shamed Acosta even more! This is why we love Sarah! But Sarah’s father had the last word! Love the Huckabee’s for standing up for vets! Great people make our country great! 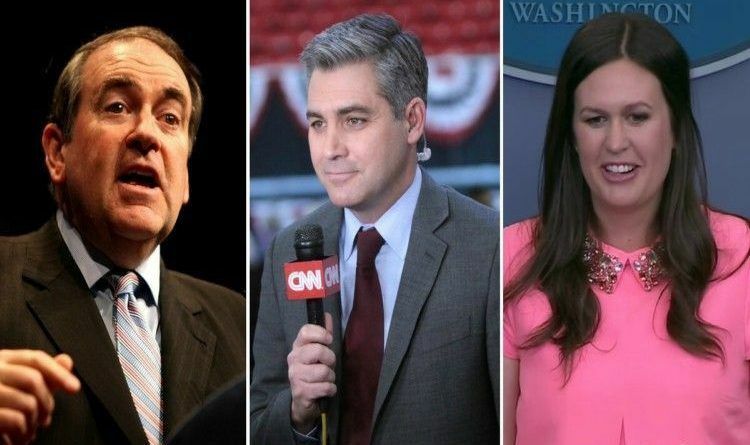 I wonder when the absolutely dense Acosta is going to figure out that Press Secretary Sanders absolutely owns him each time he opens his mouth? However, Acosta deserves the treatment he receives. He is a disgrace to journalism. In there he is not asking the questions that Americans are concerned with. He is only there to discredit this administration and promote leftist evil agendas! Do you agree with Sarah and Mike Huckabee? Scroll down to leave a comment below!